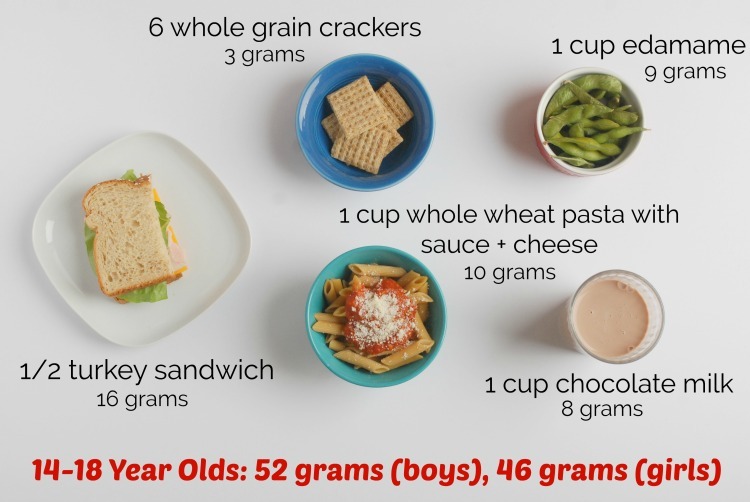 Wondering how much protein your child needs–and whether she’s falling short? 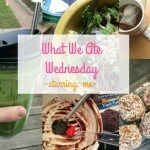 Here are some answers–and what a day’s worth of protein actually looks like! There’s no doubt protein is crucial for everyone, especially growing kids. But I talk to a lot of parents who are genuinely freaked out about protein, worried their carb-loving kids aren’t getting enough and pondering whether a big ol’ tub of protein powder might be helpful. 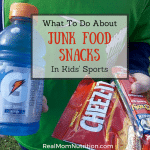 The reality is that most kids get plenty of protein–even if meat is not their favorite food. That’s because protein is found in a whole bunch of places. For most healthy kids, protein needs aren’t hard to meet. After I published my post Here’s How Many Fruits and Vegetables Kids Need Every Day, many of you asked for similar visuals for protein. The daily totals I show below are based on the Recommended Dietary Allowances (RDAs), which are the levels of intake that meet the needs for most healthy people of that particular age, life-stage, and gender. Consider these the minimum amounts needed to meet basic needs. As you can see, the RDAs for children aren’t very high, and kids can get there pretty fast with food. In fact, government surveys show that most children, like adults, get well above the RDA. In other words, freaking out about protein probably isn’t necessary! These visuals are NOT daily meal plans. 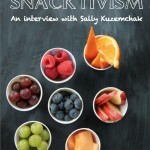 Obviously, your child should be eating more food than this! These are merely representations of how easily kids can meet the RDA for protein. For instance, kids ages 2-3 need two cups of dairy per day to meet their calcium needs, even though I show just one-half cup of milk in the visual. The age groups don’t account for differences in size, weight, and activity level, so if you have a child who is tall for his age and an athlete, his needs will be greater. There are many other great sources of protein beyond the ones I show here, such as tofu, beef, chicken, cottage cheese, seeds, nuts, and lentils. The protein amounts shown for each food are based on estimates using the USDA Nutrient Database. The label on your particular bread, cereal, pasta, or yogurt may list a different amount. 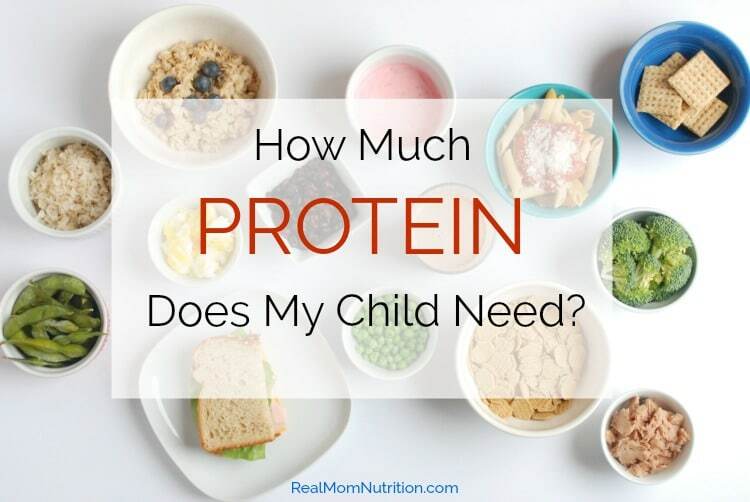 I don’t advocate for obsessing over or counting up each gram of protein your child gets. Serving three balanced meals and a healthy snack or two throughout the day will provide plenty of opportunities for getting protein, not to mention the carbohydrates and healthy fats that your child needs too. 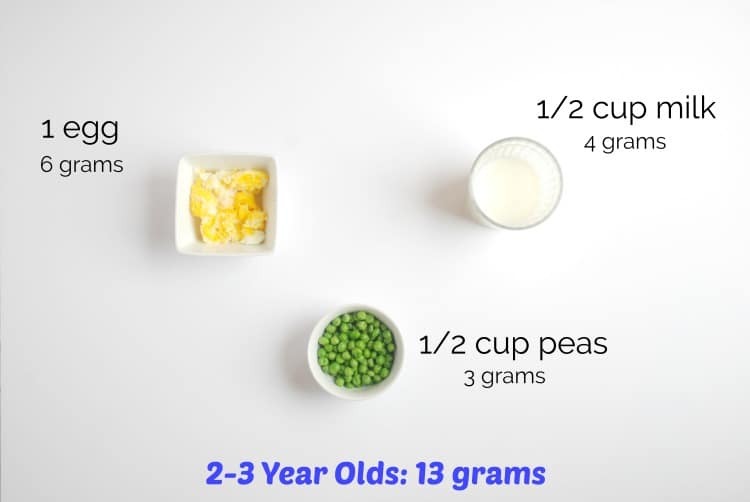 How much protein does a 2-3 year old need per day? 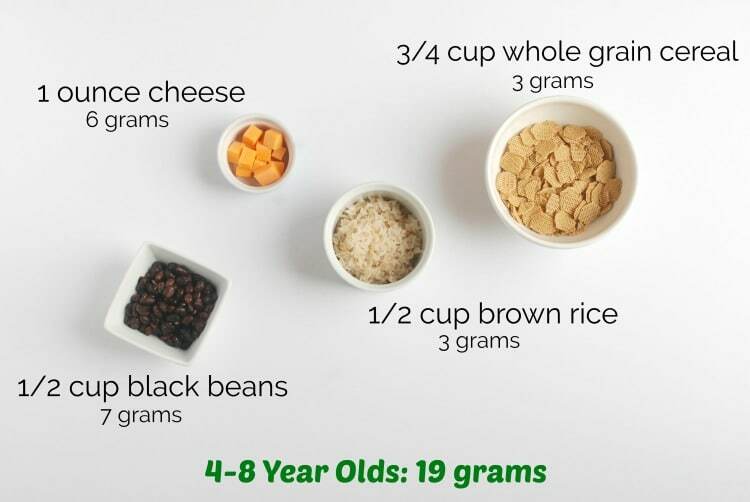 How much protein does a 4-8 year old need per day? 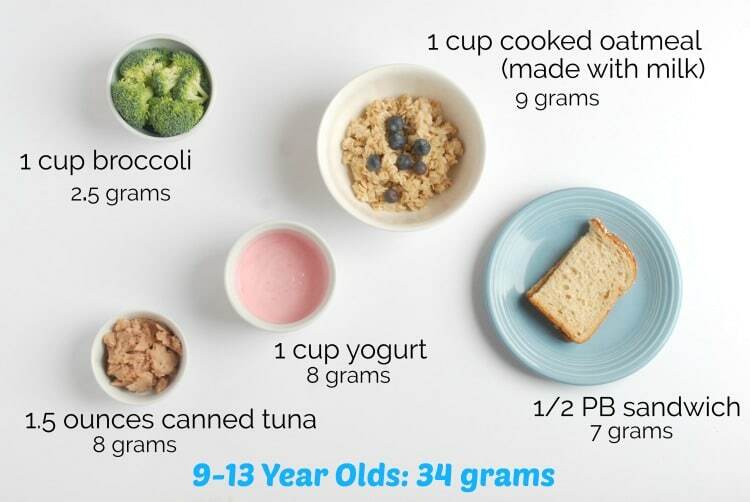 How much protein does a 9-13 year old need per day? How much protein does a 14-18 year old need per day? Hi Susan–feel free to contact me by email (sally@realmomnutrition.com) and I can help. Great post Sally. It seems everyone is really fixated on eating enough protein these days. It’s comforting to know that our kids are very likely doing just fine on that front. Thank you for using mostly non meat sources of protein. My mother is constantly on my case like meat is the only form of protein on earth! My daughter (4) usually eats carbs for breakfast. Then fruits and veggies the rest of the day. She never eats meat, beans, yogurt….I’m at a loss. I just don’t know what other proteins to try…. 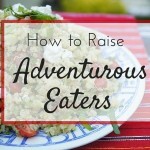 Hi Stephanie–Hopefully this post gives you more ideas. You can find protein in grains and veggies. If you’re concerned about her growth, you can check with the pediatrician, who can look at her growth curve and see how she’s doing. In the meantime, I would check the labels of the foods she is eating–chances are they contain protein! Are protein shakes safe for my 10 year old that is under weight? Your article is very FLAWED! Not only does it down-play the importance of protein, especially for adolescents and teens, but it also entirely neglects to consider the importance of other essential nutrients, such as iron. Pasta with sauce and cheese isn’t going to give your child anywhere near enough iron per day. Significant quantities of red meat, poultry, egg yolkes are almost indispensable. For example, teenage girls need 15 mg/day of iron. To put it in perspective, 2 egg yolkes is only 1 mg. 1 oz of red meat = 1 mg, 1 oz of dark meat chicken is less than 1 mg. of iron. The point is that protein cannot be looked at in a vacuum. Consumption of animal proteins should be emphasized in priority precisely because they contain other vital nutrients in high quantities.